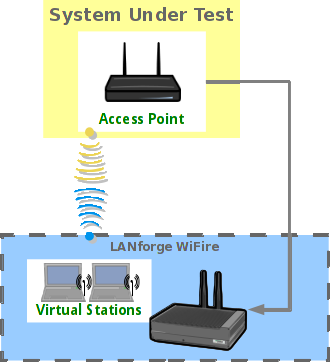 The LANforge WiFIRE feature set offers a wide range of support for testing 802.11 WiFi networks and devices. The target markets are AP manufacturers and installers and educational institutions. An example of a simple test case involves a single LANforge WiFi system and an Access Point. LANforge will emulate a large number of WiFi stations using a small number of physical radios. Each station can be configured with unique WiFi and network settings, including WPA2 authentication, Enterprise encryption and DHCP. LANforge also supports generating stateful TCP, UDP, HTTP and other higher level protocols for load and correctness testing. One or more Wired Ethernet ports on the LANforge may be used to generate round-trip traffic through the network under test. More advanced features allow for automated Captive Portal testing, comprehensive WiFi capacity testing, MU-MIMO throughput testing and real-world throughput testing for field deployments.